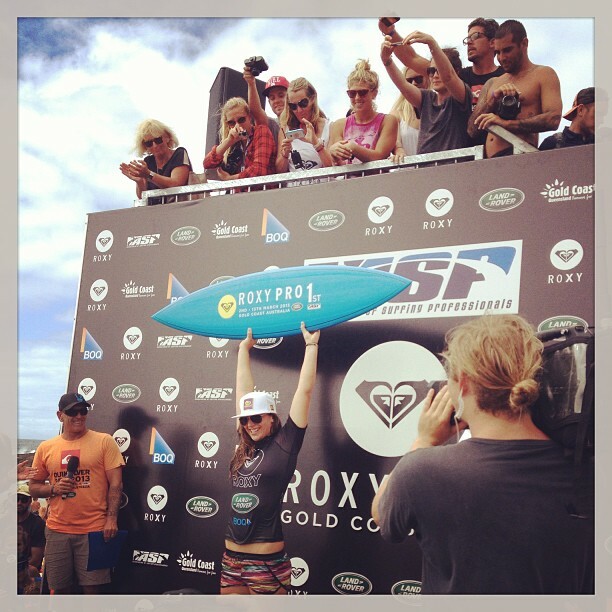 Tyler Wright after winning the Roxy Pro Gold Coast, the first stop on the 2013 ASP Women’s World Championship Tour. rose to the top with nary a trace of ambition. The sun is yet to rise. Tyler Wright is in good spirits, carefully studying invisible waves on a barely discernible horizon. Nearby, Carissa Moore also stares seaward as Praia do Guincho in Portugal comes to life before them. They are locked in a quietly blazing battle. It’s only the top of the world that’s at stake. Thirty hours later, Tyler’s second in the world with no hopes of climbing higher, at least not this year. She congratulates, hugs, and laughs with the woman who took the title from her hands. But you see, she never, actually, saw it as hers. She never expected to be in contention for a world championship. She found herself here. And instead of succumbing to the pressure that accompanies such a situation, Tyler simply ignored it. At the 2013 Rip Curl Pro Bells Beach, the third of a then-indeterminate number of events, Tyler and Carissa faced each other in a final for the second time that year. It was Tyler’s third in three contests. It was the start of the title race that wasn’t. Partly because the race was all but deadlocked until its conclusion, and partly because one of the top contenders wasn’t acknowledging its existence. It was early to start sniffing around for a title battle, but with a slew of head-to-heads, it was hard not to. By the time Tyler won in Rio, at the fifth event of the year, she was still saying that a world championship cup was the last thing on her mind. It seemed unfathomable that Tyler was truly indifferent to the title race. How could she be?